Being a perfectionist usually has a negative connotation. The one who finds himself or herself reeling after “failures” is seen as someone who cannot achieve happiness or let alone, satisfaction. But people throw shade on this fastidiousness without understanding its value. There is wisdom with turning down a compliment such as “good job”. These two terms may only imply mediocrity in the eyes (or ears for that matter) of the fastidious one. . . .in art this feeling of dissatisfaction is wonderful. It always pushes us forward. Suffice it to say, Mr. Carvalho is one who doesn’t settle for less. And such a mindset is a gift to the visual arts. He does not merely do it for self-expression; he does it because he wants to better the industry; he wants to contribute sensibly. For this, we are truly grateful. Forging himself as a digital artist wasn’t a walk in the park. 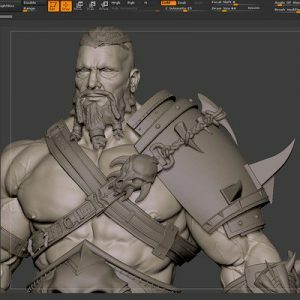 Mr. Carvalho’s journey to become a Character Artist is paved with challenges and musings on what path to take. He had already been a lot in his life: a teacher, designer, entrepreneur, graphic designer, art director, before he assumed this latest role. It was here that he had found love. It was here that all made sense. To have these experiences—to be these various personas—means that he had garnered a great deal of wisdom. This wisdom is something that he is not shy to share with us in this interview. So join us now and get to know ZBrush Mr. Flauberth Carvalho and see how real artists are made. Xeno Creatives (XC): ZBrush is impressive in that it innovated production in the 3D industry. But we do understand that it does take a lot to get used to. What processes did you have to go through to work efficiently with it? How did ZBrush help you in your craft? 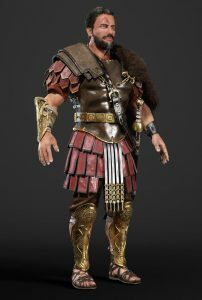 Flauberth Carvalho (FC): I started using Zbrush when I decided to focus on the character art area. As I was already used to other 3D software, it was not difficult to understand how it worked as a tool. However, its basic concept is very different. In ZBrush you are a sculptor. So notions of aesthetics, art, proportion, anatomy are the key to good results. Understanding ZBrush as a tool is fundamental because this will give you infinite possibilities. I started by studying Zbrush wrong. I wanted to master the tool, but in vain. My art was still weak. When I started to leave the application and study anatomy in detail, concepts of proportion and observation, I started to evolve. These are things that a lot of people tend to neglect. XC: When did you decide to use ZBrush as your primary tool in producing 3D art? Do you want to just focus on it or do you still have other media in mind? FC: Currently my area of ​​production are characters for games, cinematics, and 3D printing. And the best tool for this job is ZBrush. Since I still have a poly-by-poly background, I often seek help for traditional software. I think this favors me. FC: I started using Modo 701. For a 3D generalist, this is ideal. Easy and practical. Then I started using ZBrush, and with that, I did not stop. I’ve always been looking for solutions to certain problems I was facing. And so, entered the list 3Ds Max, Maya, Marvelous Design, Substance Painter and the like. I like to learn new tools. When I can, I’m always learning. XC: How did you start with 3D art? Was it a passion, a hobby, or just a mere job for you? FC: I was forged to be a graphic designer. I worked a lot of time and advertising. And in 2011-2012 I fell in love with the possibilities that 3D could bring. I dropped what I was doing and started in 2013 to study 3D, but I still did not know what I wanted to do. With time and with the studies and mainly with contact with the area I saw that the area of ​​character design was something fantastic. XC: Your works online are AWESOME. 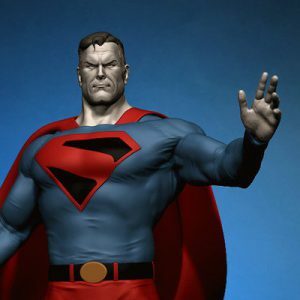 We like your impression of Alex Ross’s Superman, The Barbarian, and the Roman Soldier. The anatomy and musculature are fascinating. We know it’s going to be a tough question but we gotta ask, do you have favorites? What are these and why? FC: Thank you. 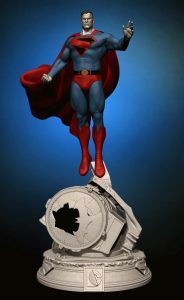 I think I can say that I like Superman better as it was my last personal project. But I still think I need to improve a lot. What I do is something commercial, but it’s also art. And in art this feeling of dissatisfaction is wonderful. It always pushes us forward. XC: Who do you consider your influences? How did they influence you? FC: I started very early with art. My mother was an artist—she taught me a lot. So drawing and painting was something that has always interested me. So it was my first influence. The 3D world is huge. There are many wonderful artists these days. And I can proudly say that many of them are also Brazilians like me. I think there must be something in the water of our country. But I get inspired in different areas. I like classical art with its sculptures and paintings. These great artists should be references for digital art. I would like to imagine that today we are the ones playing the role that these artists did in the past. But in my area, if I were to choose my reference and inspiration I would say, Igor Catto. 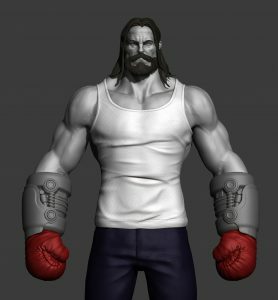 He is someone whom I learned to use ZBrush from. Also in my list are Raf Grassetti, Hossein Diba, Vimal Kerketta, Leticia Reinaldo, Daniel Bel (my biggest inspiration today) and Rafa Souza, with whom I learned a lot about Art and observation. FC: I’m very uneasy about it. When I’m producing one piece, I’m thinking of the next one. It gives me strength to continue. 3D is a slow results area; if you are not always motivated to create, you may find it difficult to always improve. And if I could choose, I would like to create a piece that may be well known and mainly respected for its beauty and execution. FC: Yes of course. As this Character Production Market is very competitive, I do not rule out any possibility. But my focus today is to fight to keep me in this character artist market. FC: Thank you. That would be awesome. But at the moment I am nowhere. Creating is something I’m always doing, even when I have references to produce. The spirit of Character Design is something that the artist must always have. But I like the modeling, the execution and having something finalized by myself, even if it was the idea of another artist. FC: I’m 37 today. And since I’ve been working. I was a teacher, designer, entrepreneur, graphic designer, art director, and now a character artist. I do not want to see myself doing anything else. I like what I do. Makes my inner child dream; I wish I never grow. And I’m currently competing with people 10 – 15 years younger than me and very talented. It’s a difficult market, but not impossible. FC: If you want to get into the career of programming and development, study the software, and more. But if you want to be a digital artist, be more sensitive to art. Learning art fundamentals will be much more important than tinkering with a tool, which you find today easy through the internet. Everyone shares technical knowledge, but artistic sense is something that needs to be acquired alone. Mr. Cravalho, we have learned a lot from your narrative. We are completely grateful for the opportunity of having to know your experiences and the wisdom that you had received from them. We wish you all the success in your future endeavors!